We are delighted to invite you to attend the XXVII World Congress of the International Association for Suicide Prevention which will take place in Oslo, Norway between the 24th and 28th of September 2013. 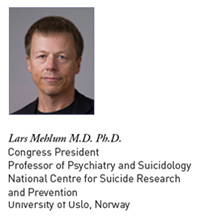 The congress will be organized by the National Centre for Suicide Research and and Prevention at the University of Oslo in collaboration with IASP, supported by the Norwegian Directorate of Health and sponsored by the World Health Organization (WHO). of the IASP in Oslo in September 2013! On every Continent suicide represents a strong challenge to the safety and well-being of people of all ages. The number of lives lost each year through suicide exceeds the number of deaths due to homicide and war combined. Suicide attempts and suicidal ideation are far more common; the number of suicide attempts may be up to 20 times the number of deaths by suicide. Some risk factors for suicide, such as mental disorder, are supported by a wealth of research data, whereas others, such as financial problems and cultural factors, are less researched, but still of great importance. It is important to be aware of the fact that though risk factors may be complex, suicide is a preventable societal problem. Much effort from researchers, clinicians, volunteers and survivors of suicide bereavement is currently being made on all Continents to create, disseminate and put to use new knowledge on how to prevent suicide. 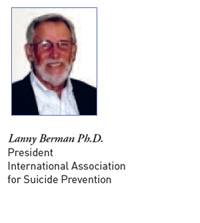 The biennial world congresses of the IASP have established themselves as the key venue for sharing of research results, prevention and intervention strategies, knowledge and experiences; and everyone with an interest in suicide prevention should make it a priority to attend. The Oslo 2013 congress will provide all delegates with a rich scientific programme highlighting the latest developments in suicide research and prevention and aims to cover a broad range of topics and interests.A key word to all content is innovation. The enormity of the problem of suicidal behaviour world-wide calls for creative and courageous efforts to bring new ideas and new knowledge into practical work in effective approaches of treatment and intervention. We encourage all of you to use the XXVII World Congress of the International Association for Suicide Prevention to share your own experiences and take part in formal and informal discussions spanning a wide range of topics. An exciting social and cultural programme and an opportunity to experience the flavour of Oslo and Norway with its many touristic attractions will hopefully make your conference experience complete. The congress is under royal patronage of HRH The Crown Princess Mette-Marit.